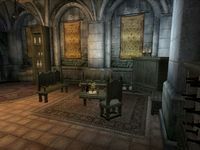 Dorian's House is an upper-middle class home in the middle of the Imperial City's Talos Plaza District located across the street from Sevarius Atius' House and next to Jakben Imbel's House. 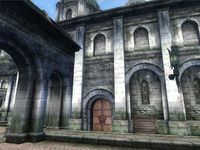 It is the residence of Dorian and contains three zones: Dorian's House, Dorian's Private Quarters, and Dorian's Basement. The front door enters into the moderately sized lounge area of the two-roomed ground floor. Two clutter barrels sit beside a silverware shelf on the northern wall with three clutter sacks and a tableware shelf adorning the area adjacent to the front door, on the eastern wall. A pantry stands against the wall that separates the lounge from the dining area. The lounge area has two cheese wedges upon a ceramic plate, and an alcohol cupboard in the corner, with two clutter sacks and a chest resting in the same corner. A wine rack sits in the far corner with six bottles of Tamika's West Weald Wine, six bottles of Surilie Brothers Wine, and two bottles of cheap wine. Some silver goblets sit on a shelf beneath. The second room on the ground floor is sparsely populated by a dining area and storage. Upon the dining table, three hams, an apple, and a loaf of bread with three bottles of mead rest upon silver tableware. A pantry with three bottles of Surilie Brothers wine, two bottles of cheap wine, and a single bottle of Tamika's West Weald wine atop it stands next to a clutter chest. Two storage barrels stand in the northeastern corner with another sack while a chest and three clutter sacks sit in the southeastern corner. The private quarters are also quite spacious. 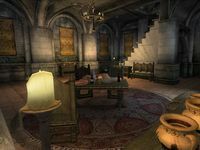 Like the ground floor, the private quarters are split into two rooms, with the first serving as a study and the second as Dorian's bedroom. In the study, a large tableware-shelving unit holds a mixture of silver and ceramic items upon it. A smaller shelving unit in the corner, among a clutter sack and a chest, houses more ceramic ware. Upon the desk against the wall, a copy of Gods and Worship rests near a bottle of Tamika's West Weald Wine with a silver tankard to drink it out of. A bottle of Surilie Brothers Wine can be found upon the table in the northeastern corner with a cheese wedge and a handful of flax seeds. There is a chance more wine will appear in the alcohol cupboard where two bottles of cheap wine and another bottle of Tamika's West Weald Wine can be found. A small area of the study is dedicated to storage, with two chests, a barrel, and some sacks appearing near the alcove behind the stairs. Going through the door in the northern wall will lead into Dorian's bedroom area. A locked jewelry box rests upon a chest of drawers to the right as well as a pair of blue suede shoes and gold trimmed shoes and another chest of drawers with a red velvet outfit upon it. 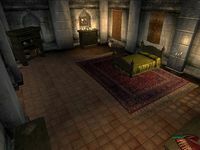 The left-hand side of the room consists of a bookshelf, a wardrobe, a locked chest containing minor loot, and more clutter sacks. 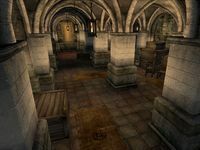 Like many others in Cyrodiil, Dorian uses his basement mainly for storage. Going down the steps, two clutter sacks and a clutter chest lead to two food storage barrels. Six storage crates, five barrels, and two chests can be found scattered around the large basement with a few sacks, one of rice, one of flour, and others holding other random clutter, hiding among some crates. Dorian carries the sole key to this location. 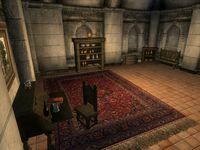 Private Quarters: Every sack, the chest on a table behind the steps, the chest by Dorian's bed, and the locked jewelry box. There are multiple objects throughout Dorian's House that float for no apparent reason. This page was last modified on 8 July 2018, at 10:42.